It's that time of year again, ladies and gentlemen, boys and girls, when we put on our glad rags, dust off our bling and crack open the Asti Spumante to honour and reward (well, sort of) those who have contributed to our enjoyment of the game in 2009. Forget the farce that was BBC Sports Personality of the Year (Ryan Giggs? My arse!) and welcome instead to the 3rd annual Total Flanker Awards ceremony. Yes, another year has passed since we handed out our last set of prestigious trinkets, a year in which has been very good for the likes of South Africa and Ireland but which has seen the game as a whole tainted by drugs scandals, fake blood, eye-gouging and an inordinate amount of aimless kicking. Moving swiftly along, it's time for the Total Flanker Tarnished Halo Award. This award is for the team or individual whose previously impeccable reputation has taken something of a kicking over the last 12 months. There are a few candidates - our favourite son of orange, Mr Gavin Church, for instance, has seen his star wane to the extent that it is now unclear whether he has a future in the game at all. And, despite a French renaissance of sorts, perhaps it is finally dawning on the world of rugby at large that SuperJonny's powers to influence the outcome of an international rugby match are not nearly as persuasive as they once were. Matt Stevens' reputation also went down the pan in 2009 alongside several Bath colleagues and Dean Richards managed to achieve pariah-status over Bloodgate. However, and it pains me to say this, this award must go to England manager Martin Johnson. An iconic player and captain, Johnno's tenure as manager has so far been riddled with conservatism, indecision and an uncharacteristic reluctance to be ruthless. I desperately hope that he proves his critics wrong and this award proves to be entirely unjustified but, until then, I'm afraid he's stuck with it. Next up is the Total Flanker How to Make a Bad Situation Worse Award. The aforementioned Dean Richards (not to mention various other parties at Quins who somehow got away with it) comes very close to securing this one for his role in Bloodgate but he is pipped at the post by none other than "the Plank" aka Justin Harrison. Faced with a situation in which a club team mate, Matt Stevens, had tested positive for and received a 2 year ban for taking cocaine and with his club under fierce scrutiny, the Plank decided that it would be a fabulous idea to go on a bender at the end of season party, declaring that "Class A is OK" before being observed partaking of the said narcotic before getting in a fight with a Quins player outside a Fulham pub. The subsequent fallout involving the resignation and banning of 3 other Bath senior players is something that the club is still struggling to recover from. Well done Mr Harrison. At this point it is obvious that, having just missed out in the last two categories, if there's any justice in this world then Dean Richards simply must win a coveted TF Award in 2009. By popular demand, therefore, I am delighted to announce that Deano is to receive the Total Flanker Scapegoat of the Year Award. It takes some doing to conclude that a conspiracy involving at least one player, the coaching staff, the medical staff and the executive committee of a rugby club was all the fault of one man and one man only - but that is exactly the conclusion that ERC reached, conveniently brushing its own manifest failings under the committee room carpet. 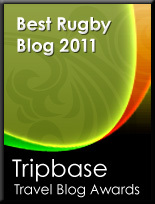 Turning now to the penultimate award tonight, the Total Flanker Coco the Clown Comedy Award. Harlequins' Tom Williams was for a while the front runner for this one after his ludicrously obvious attempt to convince match officials that he'd cut his mouth by spewing litres of ketchup whilst staggering around as if he'd been darted by a tranquiliser gun. Comedy genius. However, the performances of Peter de Villiers during the Lions tour this year were on another level. His defence of Schalk Burger's attempts to remove Luke Fitzgerald's eyeball were particularly worthy of nomination and the line "we might as well go to a ballet shop and all get tutus and get a great dancing show on for all to see that has no eye-gouging, no tackling, no nothing and we can all in enjoy it" is almost Pythonesque in its comic brilliance. And finally - and on an upbeat note - we reach the Total Flanker Punch & Judy That's the Way to Do It Award. In this age of risk-averse conservatism and of endless squad sessions and over-coaching, one man was able to bring together 35 players from Britain and Ireland and, in next to no time, knit them into a cohesive unit playing effective and attractive rugby. That man is, of course, Ian McGeechan. Yes, the series was lost but only just and, in restoring credibility to the Lions concept, a concept that many were beginning to question, Geech has done the game a big favour. Shame it cost him his job at Wasps ultimately but I doubt he'll be short of offers. Total Flanker Punch & Judy That's the Way to Do It Award - Ian McGeechan. Flanker, pretty tough to argue with your choices. I'm glad that you gave Geech a shout out that was deserved. I though Geech did a very good job with the Lions tour in RSA. You take away O'Gara's late game madness in game two, I think it was a successful series with some very compelling rugby-much improved from the debacle in New Zealand 4 years ago. PS-Merry Christmas, Flanker, to you and your family.